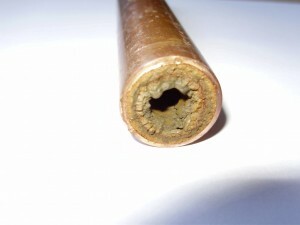 The picture shows a 22mm copper pipe full of soft brown sludge which only left a hole the size of a pencil. The customer complained that the radiators were not heating up properly and it was no wonder as the circulation was severly restricted by the sludge. The cause of this was due to the incorrect positioning of the cold feed pipe in relation to the vent pipe causing air to be drawn in to the system over a long period of time. The boiler return was also sludged up causing it to over heat. This heating return pipe was so sludged up that it prevented circulation to the radiators and indicated that the boiler heat exchanger would be full of sludge.